With two generations of family owned service, Lester's Material delivers high quality, pulverized topsoil to your location. We treat your family like our family! If you don't know how much mulch, topsoil, gravel, sand or limestone that you need, use your handy calculators a try! Spruce up your yard with our Double Processed Mulch or protect the kids play area with our Playmat Mulch! Pick it up or we can deliver it to you! Save a bundle by growing your own organic garden vegetables and save a bundle with our premium Garden Soil Mix. You will see the difference in the soil....we can mix it to your specifications! "Hats off to our good neighbors!" “A BIG THANK YOU needs to go out to Bill Lester, his family and staff who have been working all night and day to help people clean up their fallen trees and debris from last night's tornado in Grayslake. 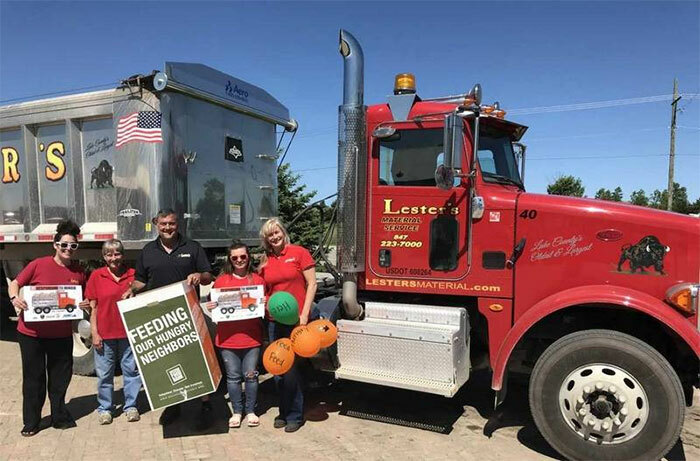 Lester's Material was proud to take part in the Touch-a-Truck food collection at the Lake County Fairgrounds! Big equipment from dozens of agencies was on display Tuesday at the Lake County Fairgrounds in Grayslake for a Touch-a-Truck event to collect food for those in need and promote the role of public works as first responders. Organized by the American Public Works Association Lake Branch in partnership with the Northern Illinois Food Bank and the Lake County sheriff's office, the lineup of about 40 vehicles capped a countywide campaign that began about six weeks ago. You'll begin by loving our materials, then our service! Place your address in our interactive delivery zone map to find your price for bulk material delivery. View the 2018 Lester's Material Price List Catalog. See what's new! Get ready for entertaining outdoors with a new Lester's Material Outdoor Kitchen! From our dirt field to your lawn - the BEST topsoil in Lake County! 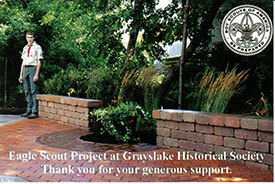 Select the BEST Lake County Lawn or Garden Mix Soil delivered to you! Freshen up your flower beds with fresh certified mulch from Lester's. Delivery or Pickup of topsoil, gravel, sand, natural stone, mulch or garden soil mix. Our Calculators help you order the right amount of Dirt, Mulch, Gravel or Sand! Lester's is the BEST and most experienced in Unilock Paver Brick Installations. The Awards of Excellence is an annual photo contest showcasing the best installations with Unilock Products. Finalists are invited to an awards banquet, where the winners are announced. Lester’s has been a finalist for many Unilock’s Awards of Excellence! We Treat Your Family like Our Family - 2nd Generation Family Owned Business! Established in 1960 with two generations of experience. Lester's is large enough to handle any size project; but small enough to give you personalized service. Our Employees Lester's Material Service hires only the best craftsmen available in the trade. We will see your project through from imagination to reality. Lester's Sales Team will help you come up with a custom design that meets your specific needs. Our Design Philosophy Let form follow function and let your pavers project become an extension of your home. By assisting you in your selection of texture and color, you are assured an excellent result. Working with Lester's Material is Easy...See How! Brother and sister Bill Lester and Lori Lester-Zwilling, owners of Lester's Material Service, walk through the yard of their material service company in Grayslake. Lester's Material Services is a 2nd Generation Family Business. Lester's Material Service, Inc., a landscape supplier located at 1980 S. Route 83, was founded in 1960 by Ron and Connie Lester, proprietors of Lester's Bison Farm. Three of their children -- Steve Lester, Bill Lester and Lori Lester-Zwilling -- now run the business known to be Lake County's oldest and largest hardscape dealer and installer. On occasion we are closed or close early due to customer traffic or the weather. It was a pleasure to work with you and your team from Lester’s, and this comes with our thanks and appreciation for a job well done. Our patio, entryways and sidewalks all look great. We’re especially pleased with the smooth transition between each space and the craftsmanship and skill evident in every cut of copthorne, in every precisely joined corner. And, I think you must have sent us the A-Team Andreas and his four-man team were so nice to work with. They were always on time, very hard working, and very respectful of our home property and job site. They willingly answered our questions along the way and worked with us to make small changes on the job. This was a quality job and good experience from start to finish! Many Thanks! © . Lester's Material Service. All rights reserved.